Guardians of Rescue volunteers act as a special shelter liaison, helping with selection, completion of the adoption process, and training for both the animal and owner. We assist with the logistics of getting a pet home from the area where the service men and women are deployed, and making sure the animal adapts to US life by providing whatever training needed. Many men and women in the service are also faced with the dilemma of pet care when deployed on active duty, and are often stuck with no positive alternatives. Animals they adopt while on deployment are in need of safe transport home, and this can be difficult to organize. The therapeutic benefit these animals provide is immeasurable, and these men and women need our support. Rescuing stray and abandoned animals in Afghanistan. Members of the U.S. military stationed on bases all over the world befriend local animals during deployments that become their companions. But they are often forced to leave them behind when their deployments are over. Our Operation Baghdad Pups program was founded in 2008 to rescue and reunite these patriot pets with our service members in the U.S. To date, we have rescued over 550 animals from multiple countries in the Middle East, Asia and Africa. Our program has expanded to become “OBP: Worldwide” and now we rescue animals anywhere in the world for members of all military branches. Until we see peace in every corner of the world, OBP Worldwide will continue to serve wherever it is needed – just like the heroes of our U.S. Armed Forces. We consider every request, regardless of the location, a chance for SPCA International to give back to our troops. Helping Soldiers bring their battle buddies home - The primary mission of Puppy Rescue Mission is to fundraise and assist various organizations which help soldiers bring their furry friends home from war. While PRM's primary mission is to assist soldiers and their furry friends, PRM will also, from time to time, assist an organization in rehoming a stray animal. Our small pet rescue in NW Wisconsin has a "Free Pets for Vets" program. Some restrictions apply. Since we mostly have cats and kittens, they are the most commonly adopted. When we have dogs, most are typically also available through this program, although there might be rare occasions when they would not be available at no cost. Horses and mini horses are typically NOT available thru this program. Pets for Patriots is a nationally-operating charity saving lives through companion pet adoption for service and veteran members of the United States military. Through our network of adoption partners, we pair at-risk shelter dogs and cats with veterans in need of a loving, therapeutic companion pet. To ensure these bonds are healthy and enduring, Pets for Patriots reduces the overall costs of pet ownership for military personnel through access to ongoing discounted veterinary care, contributions towards the purchase of pet food and other essentials and sponsor-provided pet discounts. Applicants are welcome from any armed forces and at any stage of their careers. Learn more at www.petsforpatriots.org and let us help you find your new best friend. Superior Pets for Patriotic Vets is an initiative sponsored by Superior Plumbing, which pairs shelter animals from Cobb County Animal Control with veterans, free of charge, in an attempt to alleviate the emotional scars that plague our nation's finest, while securing a forever home for shelter dogs and cats. Vets Adopt Pets is a lively upbeat national program that "Thanks Veterans for their service to us all" with a furry little friend from the pet shelter. The on going love and devotion a pet gives to each veteran is the best way ever to thank the men and women who fought for our freedom. We are a community of contributors, shelters and rescues that join together to pay the adoption fee as our way of saying "thank you" to veterans, active duty and their families. 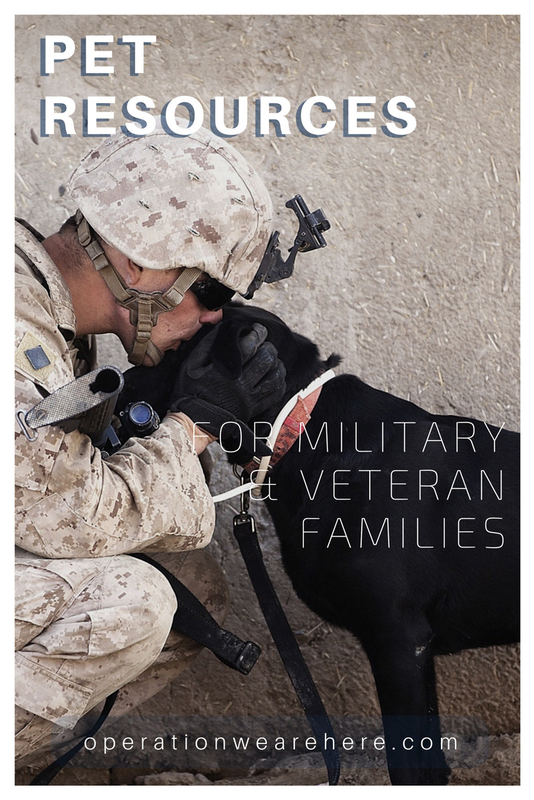 Our role is to pull together the many organizations, information and resources that exist to enable military active duty and veterans to enjoy a companion dog or cat from a pet shelter, to obtain service dog information-referrals, to honor our military working dogs, contract working dogs and their handlers. Military members nation-wide confront a multitude of problems during their career. The last problem they want to worry about is what to do with their beloved family pet when it's time for them to deploy. Asking themselves, "What should I do with my dog while I'm on deployment," many service members have limited, to no options for their pets when they have to go overseas. Many owners have to relinquish their pets to shelters when they have nowhere else to go. Dogs On Deployment is a licensed non-profit which aims at becoming a central web-based database for service members to search for individuals or families who are willing to welcome a Dog On Deployment into their home for the length of their owner's deployment. Guardian Angels for Soldier's Pet formed after learning that military service members across the country had pets that needed a caring, loving, and safe home to care for them during the pet owner's deployment to fight the global war on terrorism (combat or peace keeping missions), but had been unable to find someone to care for them. This left the military pet owners with only one option, which was to relinquish their beloved pets and pet ownership rights to a humane society, animal shelter, or animal rescue group never to see their pets again, know if they were placed in a new home, or ended up being euthanized. It is very important to keep loved ones close during uncertain times—including the four-legged members of our families. The Humane Society of the United States urges military families to work hard to keep pets in the family and resist relinquishing these beloved pets to shelters. If you are in the military, it's important to make prior arrangements for your pets in case you are deployed. If at all possible, arrange for family or friends to care for your pet. When leaving your pet with family or friends, it's a good idea to create a foster care agreement. Having a written agreement will help protect your pet and provide you with the security of knowing your chosen caretaker has the legal right to care for your pet in your absence. The PACT for Animals' Military Foster Program is designed to provide an alternative to the unwanted surrender of beloved pets (dogs and cats) of our deployed military service members. We do this by recruiting and qualifying volunteer fosters who are willing to open their homes to provide a loving and safe environment for these pets until they can be reunited upon their owners' return. Vets and Their Pets is a non-profit organization dedicated to helping veterans in-need via foster, food, and medical care for their pets. Vets and Their Pets provides temporary housing, veterinary care and food for animals of veterans in need. We will spay/neuter and provide basic shots for a veteran's animal. Our primary focus is homeless veterans or veterans in transitional housing needing assistance. The core focus is to ensure that a veteran will seek medical care for their needs while we provide care for their animals. Additionally we will support veterans that are in transitional housing by providing a home for their animal until they obtain permanent housing that will allow the animal to live with them. Anyone is welcome to transport a live animal with American Airlines Cargo. However, some countries may require a broker and/or freight forwarder for transport. For general freight, due to TSA security regulations, you need to be a Known Shipper. Discount is available for personal shipments only. Breeder shipments are not eligible for this discount. Pilots N Paws® is a non-profit organization. Our site is intended to be a meeting place for volunteers engaged in the valuable services of rescuing, sheltering and adopting animals, and volunteer pilots and plane owners willing to assist with animal transportation. The intent of Pilots N Paws is to provide an environment in which volunteers can come together and arrange or schedule rescue flights, overnight foster care or shelter, and all other related activities. In accordance with Department of Defense (DoD) regulations, animals owned by personnel authorized DoD medical care may receive veterinary medical care through an Army Veterinary Treatment Facility. The level of veterinary medical care available through each facility is dependent upon the level of professional and civilian staffing.